The generation two prototype is done and online here. The Help documentation can help you get started in evaluating and using the tool. For the big picture, please see the Politician Truth Ratings Project. We are very excited about the progress this release represents because it has the long term potential to help solve the Democracy in Crisis problem. A project we've been working on for a while has finally reached the launch point. This year, 2018, is the year Politician Truth Ratings will be implemented. The generation one prototype is done. We've received loans to get started, have engaged a software development company for specialized work, and are developing the bulk of the application ourself. Films two and three of the Democracy in Crisis film series have been released. This completes the series for now. More may be added in the future, such as films covering the sample solution elements or the Dueling Loops model in more depth. With the catastrophic saga of Trumpism playing out, it's become all too clear that democracy is in crisis. What can those who believe in the common good do? One thing we can do is understand WHY this is happening. That begins with a look at how those supporting politicians like Trump have weakened The Voter Feedback Loop. As part of our continuing efforts to get the Thwink message out, we've started the Atlanta Analytical Activists. Episode 1, The Right Question, has been been released released here. This is the first film in the Democracy in Crisis film series. The election of Donald Trump to the presidency of the United States, as part of the larger pattern of the rise of hate-based authoritarianism, signals disaster. Trump, like other authoritarians, will be doing everything possible to NOT solve common good problems like climate change, high economic inequality, large recessions, and war. Instead, he will be doing everything possible to solve problems that large for-profit corporations and the rich care about, like cutting taxes for the rich, cutting regulations, and pumping up economic growth to well above its natural level, which inevitably causes a bubble and then a recession or even a depression. The film series will show why Trump got elected, against all expectations. It will also explain how more Trumps can be prevented. Trump, of course, is merely one in a long line of authoritarians who rose to the top. The films analyze this broader pattern using the right tools, with root cause analysis leading the way. The first film is in progress. Holly Wells of EyeForNature.org interviewed Jack Harich and Philip Bangerter on Voice America. The topic was how a process that fits the sustainability problem could make all the difference. You can review a recording of the interview here. So that some of our serious listeners could better follow along, this diagram was made available. Trump won. From the viewpoint of what's best for the common good, this is an unimaginable disaster. If you would like to help avoid more Trumps, please help us on an emergency project for raising truth literacy. Why is Donald Trump doing so well, when he is clearly unqualified and his policies would do great harm to the United States and the world? Answering that question requires Digging Down to the Root Cause of the Trump Phenomenon. The Common Property Rights book is woefully out of date. Rather than a second edition we have elected to produce a new book. The title is Cutting through Complexity: The Analytical Activist's Guide to Solving the Complete Sustainability Problem. If you would like to participate in critique of chapters of the book as they emerge, please contact us. This would be valuable assistance, because we are trying to reach a broad but influential audience and the material is quite hard to relate simply, in an understandable and persuasive manner. Thwink has a new paper in progress: Triggering Transition to the Sustainable Mode with Root Cause Analysis. An invited article was published in the Spanda Journal. Presently civilization finds itself “locked into a system” and unable to solve difficult large-scale social problems like over-population, environmental sustainability, recurring wars, and excessive concentration of wealth. Problem solvers, whether they are in NGOs, academia, or government, are unable to reliably effect systemic change on problems of this class. Why is this? We know from Newton’s third law that for every action there is an equal and opposite reaction. Every effect has a cause and every cause has an effect. From this arises the Law of Root Causes: All problems arise from their root causes. Therefore the reason problem solvers are unable to solve problems of this class is that popular solutions do not resolve root causes. They instead attempt to resolve intuitively attractive intermediate causes, which guarantees solution failure. Unless the laws of physics change there can be no other explanation. To rectify this situation a comprehensive standard approach to solving problems of this class is proposed. This consists of three tools borrowed from the business world: root cause analysis, process driven problem solving, and model based analysis. The article presents the principles behind the tools and the tools themselves, followed by a sample application of the tools to the most pressing problem of our time: the environmental sustainability problem. 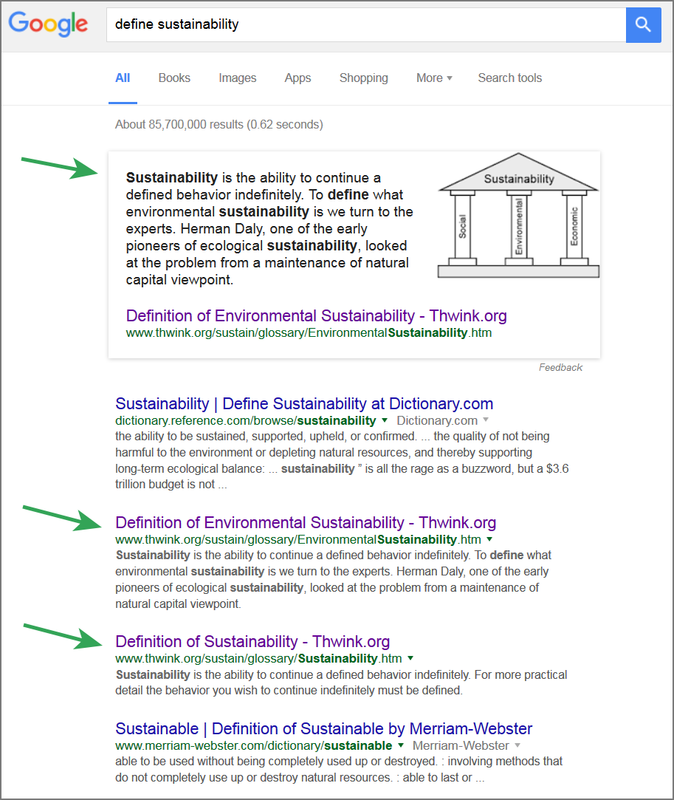 Or if you search on "how to solve the sustainability problem" you might find what we did. Thwink.org was results number 3 and 4. Suppose you're familiar with root cause analysis. You know how critical it is to find the root causes of difficult problems. 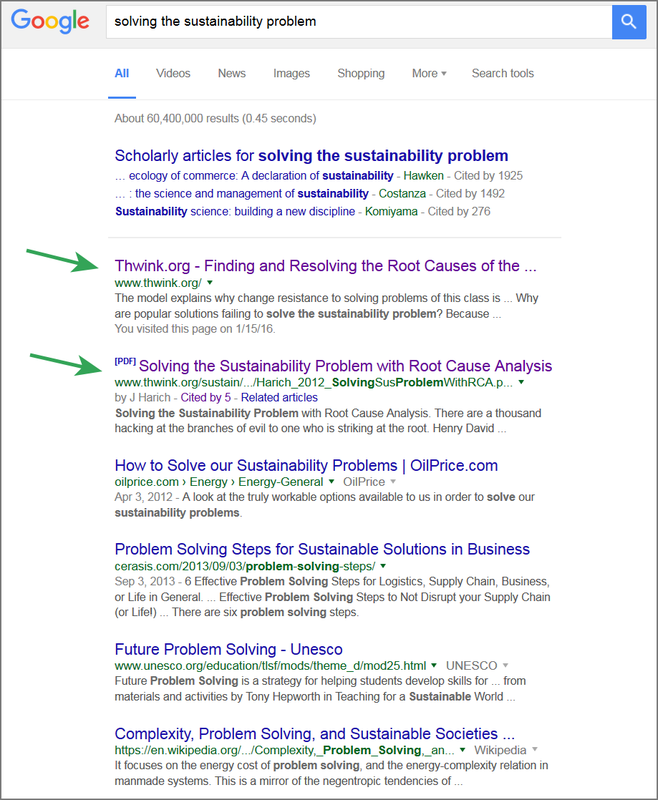 If you search on "root causes of the sustainability problem" you would find that the first 4 hits are Thwink.org material. If you know the power of modeling problems to better understand and solve them, you might extend that search to "modeling the root causes of the sustainability problem." The first 8 items are all Thwink.org, who appears to be the research leader in a few areas like this. Why can we say this? Search result rankings are determined primarily by the number and popularity of other web pages linking to a page. Each of these links was a decision by someone (in our case usually a researcher, professor, or organization) to add the link to their website because the link was deemed high quality and useful. Let's assume you have some experience in using formal processes in large organizations and know how powerfully productive the right process can be. This is especially common in manufacturing, sales, consulting, software development, and medical services. You might search on "process for solving the sustainability problem." Again, Thwink does well. Hits 2, 3, and 4 are Thwink pages. When it comes to the deeper and more advanced aspects of solving the problem, Thwink.org would appear frequently in your search results. In the above search Thwink dominates the results list. Researchers would be especially interested when they saw that a Thwink.org paper, the one by Harich, has been cited 56 times. 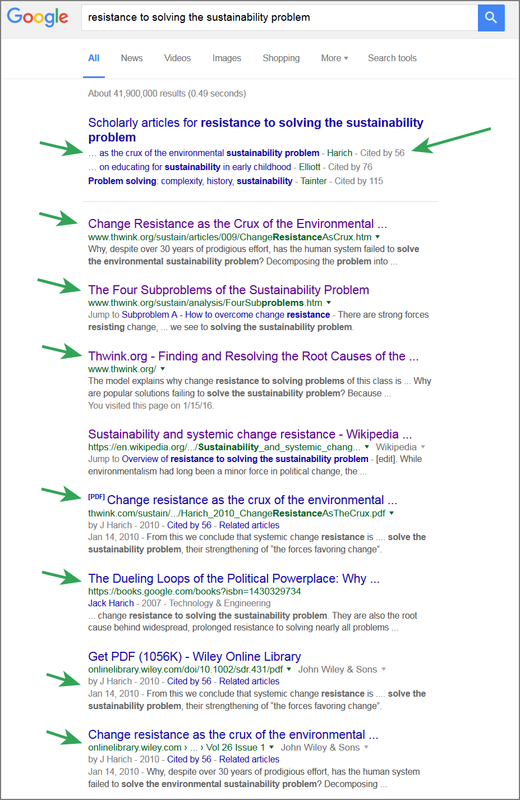 Even the Wikipedia entry on "Sustainability and systemic change resistance" was originally written by Thwink.org (with very few changes thereafter) as an effort to introduce the cohesive concept of change resistance to solving the sustainability problem. Change resistance, as our site and the Wikipedia entry argue, should be treated as a distinct and separate subproblem to solve. Thwink.org has become a respected and popular website due to its high quality material, as the above discussion of search results shows. Thus it was that on May 28, 2015 Thwink.org was contacted about participating in a survey of the world's top fifty "thought leaders" on the sustainability problem. The researcher, in Zürich, Switzerland, on this project plans to eventually publish the results in book form. Thwink was selected on the basis of the strength and originality of its research. 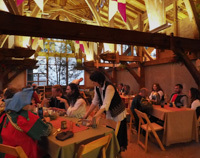 See the home page for further information. Thwink.org was founded in 2001 by Jack Harich. There are numerous collaborators. The goal was to make a significant contribution to helping to solve the global environmental sustainability problem. Since the problem had defied solution for over forty years at that point, Thwink took a different approach, a road less traveled. Rather than developing solutions, as others on the road were doing, Thwink did something entirely different. We asked the question "WHY is this problem so hard to solve?" This was a lot of slow, tedious, error-prone work. It was like entering a cave without a light and groping your way around in the dark to find anything. But once the System Improvement Process began to mature, a little glow started in the cave. Over the years that glow became brighter. After seven years of exploration, the cave was well lit. The analysis found what it was seeking. It was now time to leave the cave, publish the results, and collaborate with others. This is where we are now. It's been a tiring but fruitful journey. All work and no play makes Jack a dull boy, so in 2015, after fourteen years of more than full time work, Jack is taking a sabbatical. He will be keeping small Thwink projects going. 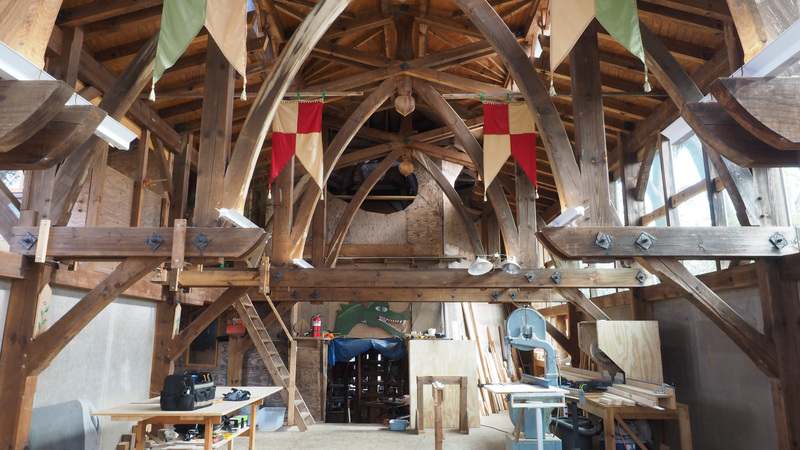 But his main effort and time will go to finishing up building The Tower, with his own hands. 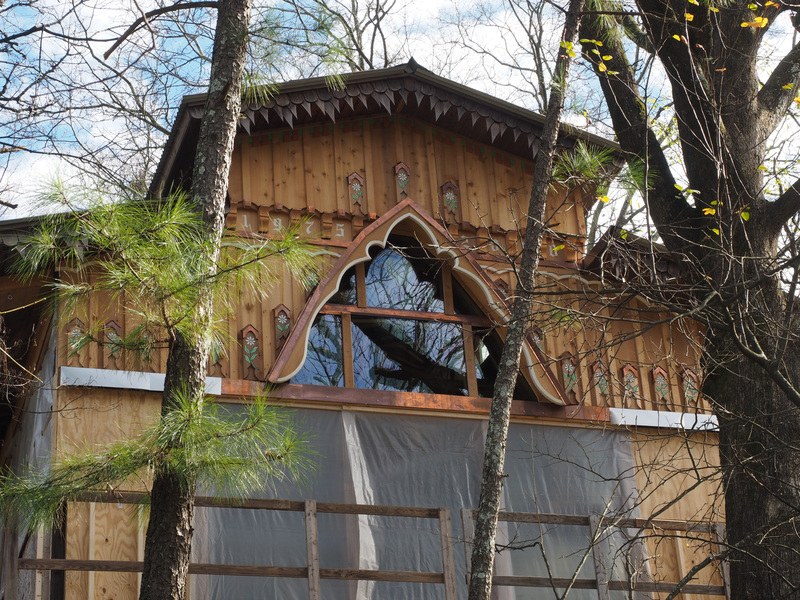 Martha and Jack plan to move into their new home in late 2016. A few pics are below. Click to see the full size versions. 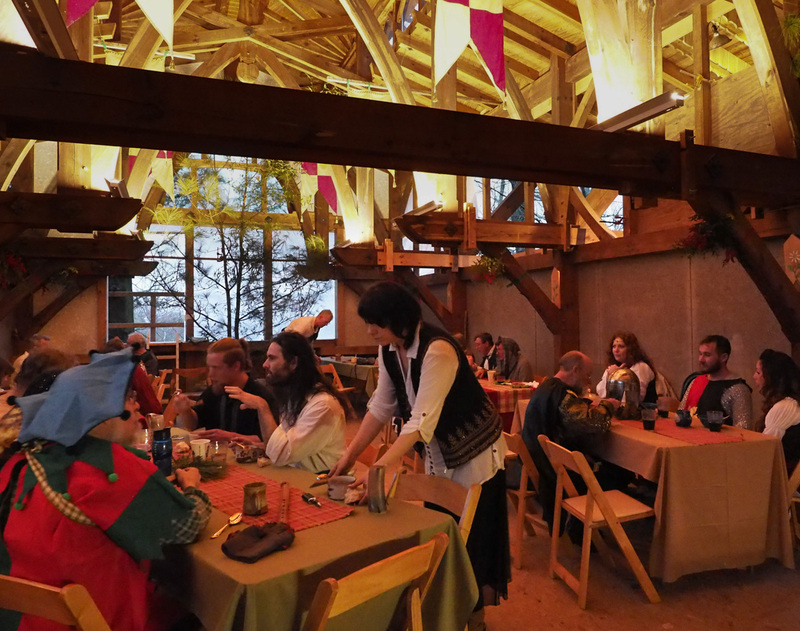 The last photo is of a Medieval Banquet we held on December 22, 2015 for our friends. For earlier photos of The Tower see this page. 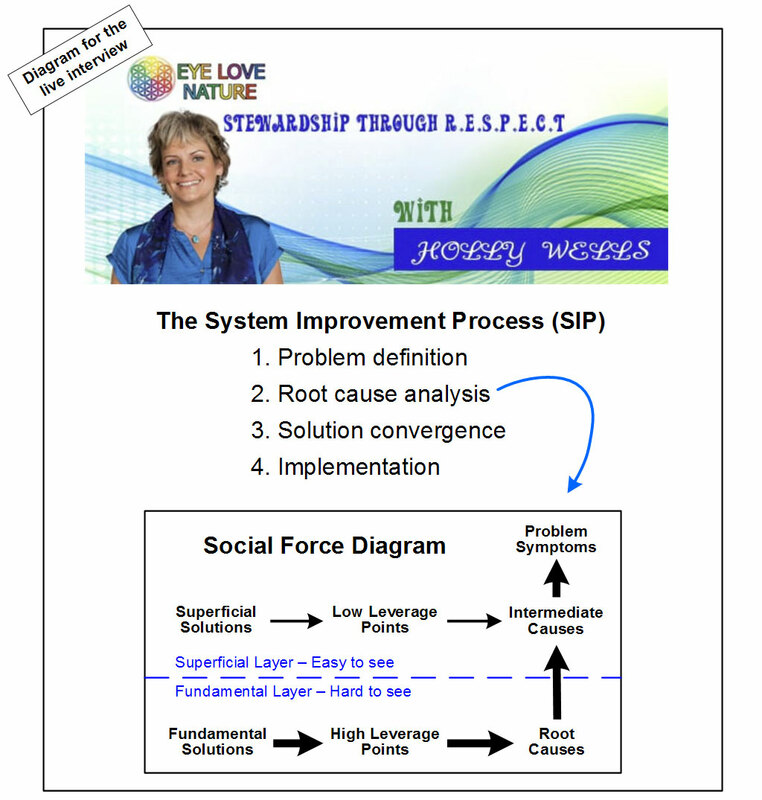 How and where does systemic change manifest? How does it unfold? What are the leverage points, the forces and dynamics at play? What are the conditions for its empowerment and enablement? How do agency and structure come into the picture? We would like to look at the subject from various perspectives and disciplines, in research and praxis, exploring the visible and the invisible, space and time, unity and diversity, level and scale, movement and rhythm. We hope you authors will enrich this inquiry, bringing new insights to those who work on the ground to make our world a better place. An abstract is due on 21st December, 2014. The article itself, an original work, is due 15th May, 2015. At the invitation of Dr. John O'Sullivan, Jack Harich and George Turner gave a talk at the University of North Georgia about the Thwink.org research program. Interest and discussion was intense. So was dinner that evening. Here's the Power Point file used. The presentation ran about 90 minutes with a break. It was supplemented with an exciting showing of the Dueling Loops of the Political Powerplace, not a video but the actual running simulation model. Feel free to use the slides in any manner. 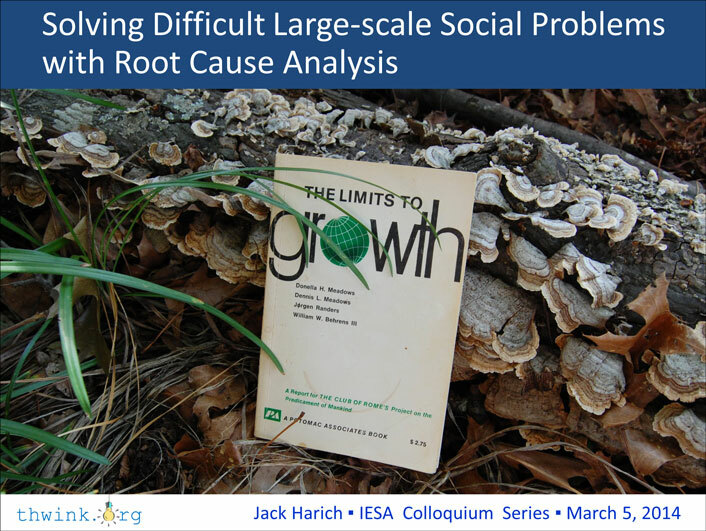 Slide 9 on "The Jefferson Memorial Erosion Problem" is an especially engaging way to demonstrate how root cause analysis works, with the implication that approach is what we should use on the sustainability problem. See this related article. What a story! A paper on Building a Foundational Framework for Sustainability Science with Root Cause Analysis and the System Improvement Process was submitted to PLOS One. Update - The paper was rejected as it was too long for its category. My mistake. The editor was very supportive of the gist of the paper and made helpful recommendations on how it could possibly be reworked and resubmitted. Here's a little Christmas present. Thwink.org has added a change resistance subsystem to the World3 model of Limits to Growth. The result is the World Change model. If we want to change the world, then we need to model how to overcome change resistance. That's exactly what the model does. A 29 minute You Tube video on Adding Change Resistance to Integrated Global Models was produced. The video explains why change resistance needs to be modeled and how a change resistance subsystem can be added to highly influential integrated models like Climate Interactive's C-ROADS and the Limits to Growth's WORLD3. 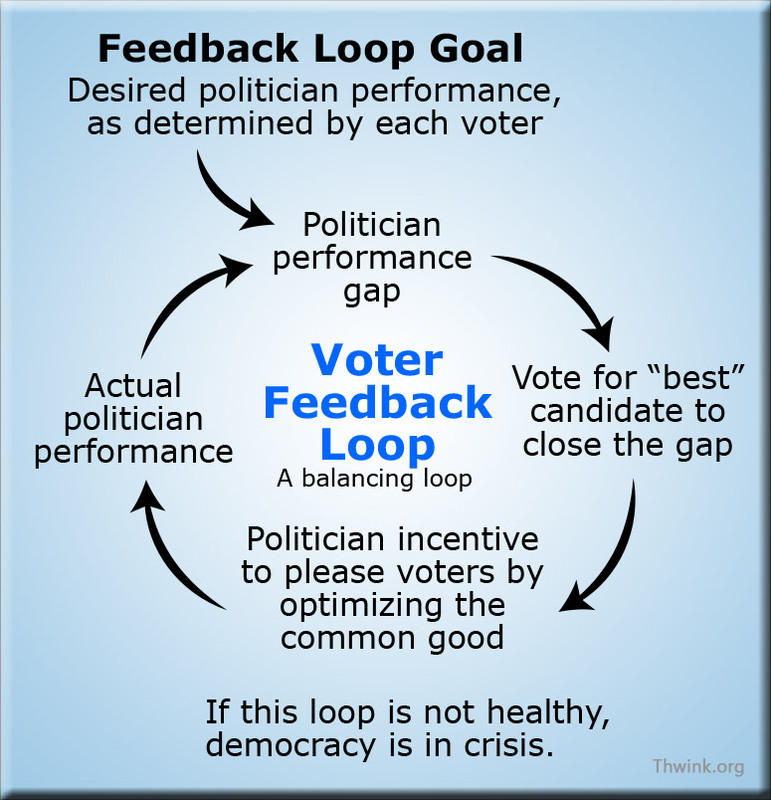 The highlight of the video is a close look at how The Dueling Loops of the Political Powerplace model works, with emphasis on the main root cause of successful change resistance. A paper on Finding True North at the U.S. EPA with Root Cause Analysis was submitted to Sustainability Science. Update - The paper was rejected. The reason was "there is not enough new analysis or insight." Hmmmm. We sure don't see it that way. A paper on Solving the environmental proper coupling subproblem with Common Property Rights was submitted to Ecological Economics. Update - It was rejected and has been submitted to Global Environmental Change. Researching and writing a paper for an A level peer reviewed journal is a lot of work. After much effort, we have submitted a paper on Finding the Fundamental Forces of the Sustainability Problem with Root Cause Analysis to the Global Environmental Change journal. Let's wait and see if it's accepted or not. - Update: It was rejected due to being too broad and not enough evidence. It will be reworked and submitted to another journal. In preparation for the upcoming Eco Summit 2012 in Columbus, Ohio, US, we have prepared three brochures. These are the best short introduction to what matters the most at Thwink.org. As a result of the conference described below, Tom Fontaine of the US EPA has invited Jack Harich to give an EPA webinar. 100 to 200 people are expected to participate. The topic is the same as the paper presented at the conference below, with emphasis on HOW Root Cause Analysis can be applied to the sustainability problem. The webinar is not yet scheduled but will probably be in October. Scott Durlacher and Jack Harich attended the Ecosystem Services Partnership Conference in Portland, Oregon, US, July 31 to August 3, 2012. Scott gave the paper presentation talk. The paper, on Solving the Sustainability Problem with Root Cause Analysis, was received with small amounts of interest. Scott and Jack had many conversations about it and the work at Thwink.org. Scott in particular made many contacts which we are following up. More. Proposals for a paper and working group have been accepted for the Ecosystem Services Partnership Conference in Portland, Oregon, US, July 31 to August 3, 2012. 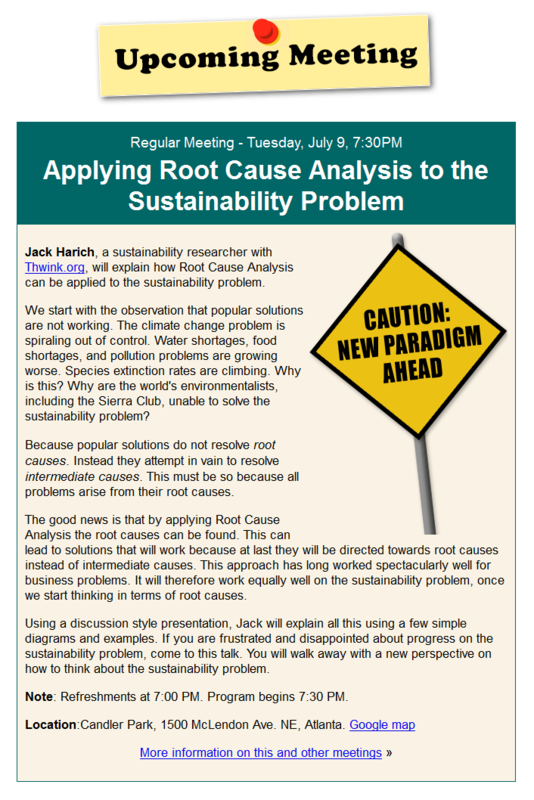 The paper title is Solving the Sustainability Problem with Root Cause Analysis. The working group topic is Resolving a Key Root Cause with Common Property Rights. This is big news, because it's a golden opportunity to spread the paradigm of root cause analysis to the academic community. The Common Property Rights project is rolling right along. To help that rolling stone start rolling faster we've created a striking poster. Titled "Strike at the Root", the poster describes why it's essential for all of us to Strike at the Root. Up until now the page conversation on Thwink.org has been one way. There's no easy way to discuss the 130 some pages on the site. Now there is. Thanks to the fine software made by Livefyre, we now have an excellent commenting system. Give it a try! - UPDATE: No one commented for a month, so the commenting system was removed. A curious result. On April 15 Thwink sent in an application for a paper presentation and working group at the 2012 Ecosystem Services Partnership conference. It's in Portland, Oregon, US on July 31 to August 4. The proposed paper is "Solving the Sustainability Problem with Root Cause Analysis." The proposed working group is "Resolving a Key Root Cause with Common Property Rights." This is an unusual conference in that it's not paper centric. Instead, it centers on working groups. Each group tries to solve a specific problem as the above link explains. We hope to be accepted because that would really push the Common Property Rights project. Wish us luck! Thwink participated in the Georgia River Network's Weekend for Rivers conference. On Saturday Jack and Martha staffed a table chock full of Thwink.org material and attended various sessions. The turnout was about 80 people, from the dozen riverkeepers in Georgia. This event was part of the project below. On Sunday Jack paddled the Chattahoochee River with 40 other kayaks and canoes. It was a weekend of many delightful new friendships. Thwink is at last moving from fundamental to applied research. We're initiating a real project with a real solution. It's the most mature and ready-to-implement of the 12 solution elements that emerged from the analysis. It's Common Property Rights. The place to start is the Bringing the Power of the Law to Environmental Stewardship pamphlet. For more see the project page. The website has been completely redesigned and mostly rewritten. This will allow visitors to more quickly find what they are looking for and understand it. The site is more focused. The glossary is the foundation of the site and has been completely rewritten with new entries added. The big blue arrow menu bar uses "mega drop downs" to let you quickly skim what the site has to offer, thereby getting the big picture in seconds. The article uses editorial cartoon style illustrations to vividly paint what is in fact a technical article. The article immediately became the most popular page on the site, due to its timely nature. This is related to an experiment. Jack is working with a local Move to Amend group to see if the Thwink concepts can help. Update - They didn't help. Classic activists tend to be extremely resistant to any other way of seeing their world. Sigh. But once again, perhaps we have planted seeds that will grow. There was some initial enthusiasm about root cause analysis and the ideas in the above article. Work has begun on a redesign and rewrite of the Thwink.org website. This is a complete rewrite of all pages plus addition of new pages, in order to better focus and convey our message. The page layout will also be overhauled. Mega menus will be used for navigation. The project is expected to take six months. This article was written especially for the Great Transition and Smart CSOs initiatives. As an experiment in how to get the message across more effectively, four pamphlets have been created. These are now on the All Pamphlets page. The first draft of the Common Property Rights book was completed. This has become the writeup for ten years of research so crafting the book is a big project. The second virtual meeting on the Common Property Rights research project in Australia was held. The third is scheduled for December 2. Philip Bangerter is managing the project. Meetings consist of 4 or 5 researchers discussing project progress and actions. Currently the main work centers on publishing two more papers. Once these are accepted the next step is initial funding. The second video on Common Property Rights was released. This covers the seven components. The final kickoff meeting concerning a Common Property Rights project in Australia was held. There were three researchers, plus Philip Bangerter and Jack Harich. Results: "There is strong support for further development of this project among all on the call. Joseph has also offered his support to the concept in a previous call. It is clearly ambitious and will be a project portfolio at least, once we have the expected momentum and some funding." The next step is planning and funding. The first video on Common Property Rights was released. This is much better and replaces the one below. A ten minute high definition You Tube video on Introduction to Common Property Rights (CPR) was completed. This the first in a series intended for researchers interested in evaluating the concept. CPR is so novel it's proven to be hard to grasp, so much new research and synthesis, including a new causal flow model, an improved simulation model, and review of the work of several influential economists, has been done. The series will analyze CPR and explain why it's so different from other solutions using these materials. 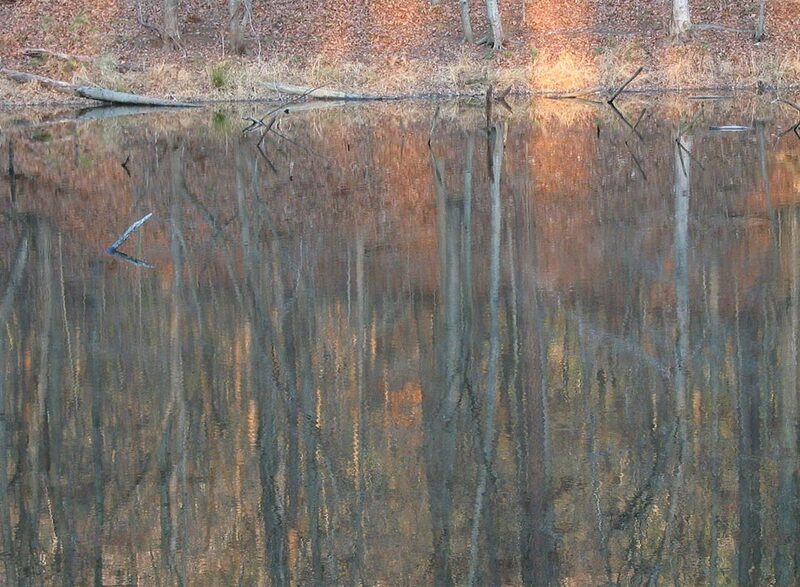 In Virginia, US, the Rappahannock Watershed Business Council met to move two projects forward: a Marketplace or Exchange 2.0, facilitating and tracking the sale of River/Bay-Friendly products and services, and a Cooperative/Utility buying “high efficiency” restoration projects throughout the basin. The latter is a Common Property Rights steward. The next meeting is scheduled for early August. Philip Bangerter reports that the director of the Australian Centre for Sustainable Business and Development at the University of Southern Queensland is supporting the initiation of "A proposed project to parallel a US initiative in common property rights for environmental stewardship." If this or the proposal mentioned below leads to an actual project, it will mark the first ever application of the concepts at Thwink.org. Michael Collins has proposed a project in Virginia, US, that incorporates the concept of common property rights. 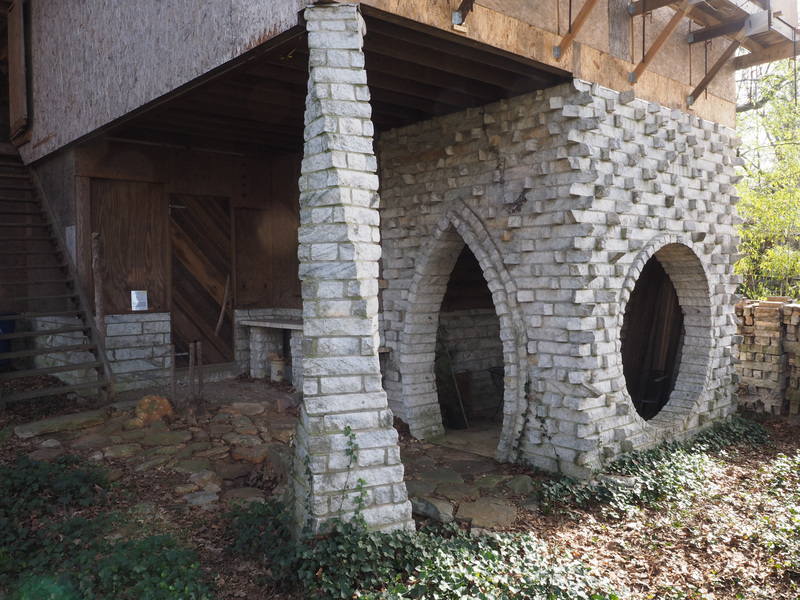 Jack Harich visited Michael Collins in Virginia for two weeks to work on an application of Common Property Rights. Michael has a project going that will benefit from incorporation of this concept. Michael read the Change Resistance as the Crux paper and contacted Jack, which led to collaboration. The Change Resistance as the Crux paper has been published. This is important news, because at last there is peer review recognition of the value of some of the work at Thwink.org. After one resubmission, Change Resistance as the Crux of the Environmental Sustainability Problem has been accepted for publication in the System Dynamics Review. A big thanks to all those who helped on this. Good news! Over the last five years Thwink.org has submitted 5 popular environmental magazine article queries, 2 book proposals, and 2 peer review journal articles. All were rejected. Now, our fortune may have changed. Our third peer review journal submission has not been rejected! Instead, we received a note saying "A revised version of your manuscript that takes into account the comments of the referee(s) will be reconsidered for publication." Now there's lots of work to be done on polishing Change Resistance as the Crux. A paper on change resistance has been submitted to a peer reviewed journal. This is our third attempt. The first two were rejected. This time Steve Wehrenberg has been kind enough to review early drafts, so we have a much better chance of acceptance. A journal submission of a academic treatment of the Dueling Loops paper was rejected. The feedback was extremely helpful and we are now rewriting it. It's official. Jack will be traveling to Canada in March to meet/work with Philip Bangerter and Hatch, on a project that may eventually lead to a serious effort to apply the Thwink paradigm to the sustainability problem. The Dueling Loops paper received it first review, on this blog. Philip has started a crucial thread on the forum concerning the need for an organization "for the bigger problem this forum talks about." A book proposal for Process Is Everything was submitted to Island Press. Update November 5 - It was rejected with no explanation. If you know of a publisher or literary agent who might be interested, please let us know. The Daily Analysis blog style column was added to all Thwink.org pages. This adds fresh, productive information to those who keep returning to the site for a deeper look at this new way of thwinking. It also draws newcomers into the site via smaller, easier to digest read bites. A big thanks to Robert Gowans for suggesting this improvement. Update: It was removed after a one week experiment, as explained here. Robert Gowans of Tyresö, Sweden will be taking over website management and internet marketing of the Thwink message. Rob has a number of promising strategies he will be using, which you can read about in this forum thread. Update: Due to a sudden health problem in his family, this is all on hold. Jack Harich of Thwink and Philip Bangerter of Hatch in Brisbane, Australia had a phone meeting on "realignment." Philip explained that after getting through a period at Hatch where he was unable to devote any time to promoting the Thwink paradigm, he is now in a favorable position to do so. He will be proceeding to do three things: (1) Sell his new boss on the Thwink approach, which should be straightforward, (2) Meet with 5 to 10 of Australia's leaders in the field of sustainability to sell them, and (3) Start serious work on getting funding for a project along the lines of The Diagnostic Project. This is very good news. Jack explained how film one is perfect for (1) and (2). Philip is eagerly awaiting the film. The full length film Cracking the Mystery of the Progressive Paradox was released. This is expected to make the Thwink message ten times as easy to understand as papers, books, and web pages. Early testing shows this to be true. Chelsea Green said no on publishing the Dueling Loops book. They also had no comment on why. This seems to indicate that even the most qualified publisher of political/environmental books in the world was unable to grasp the new paradigm of the book. Probably no publisher will, until we can find someone who can personally explain to them. All this is to be expected. It's part of the systemic change resistance side of the problem and the phenomenon of being unable to comprehend any paradigm but the one you are living in. Chelsea Green, our preferred publisher for the Dueling Loops book, has replied favorably to an email conversation we've been having. They have requested a copy of the book for review. Preparing the "final" manuscript is where all our attention is going now. Several readers have been extremely helpful in making it a better book. A pre-publication copy of The Dueling Loops of the Political Powerplace has appeared on Amazon. If you've read it, post an honest review. This will help those who have not previously heard about the book. Philip Bangerter visited Jack in Atlanta again. While in town he had lunch with Ray Anderson, the foremost proponent of sustainability in the business world. Ray agreed to visit Australia to make a speech at the opening of one of Hatch's new offices, and gave Philip a few sustainability contacts. Philip Bangerter and Michael Hollcraft came to Atlanta for a few days, in the first serious meeting for how we can move these concepts forward. Things are happening. Keep up with them on this thread and others on the forum. The manuscript to Analytical Activism is now complete. Copies have been mailed off for critical reviews. You can request a copy or download and print one yourself. The most popular paper on the site, The Dueling Loops of the Political Powerplace, is about to become a book. If you would like to provide feedback before it goes off to the publisher, download it, read it, and let us know how we can make it a better book. Thwink.org has been selected as an Editor's Pick at the list of links for the Science and Research section on Sustainability at EcoEarth.Info. Out of 30 links listed in this section, 7 were Editor's Picks. Besides Thwink.org, these are the Millennium Ecosystem Assessment, the Worldwatch Institute, the Earth Institute, the Forum on Science and Technology for Sustainability, the Global Change Master Directory, and the Union of Concerned Scientists. Nice company to be in! Solution Factories, the final chapter in Analytical Activism, is now complete. The ideas that have emerged from development of this chapter have caused Thwink.org to cast itself as the world's first solution factory. Read the chapter to see for yourself how germane that outlandish title may be. The Glossary of Key Concepts has been added to Thwink.org. This is a major document running about 30 pages, with 50 terms and short essays on each term. 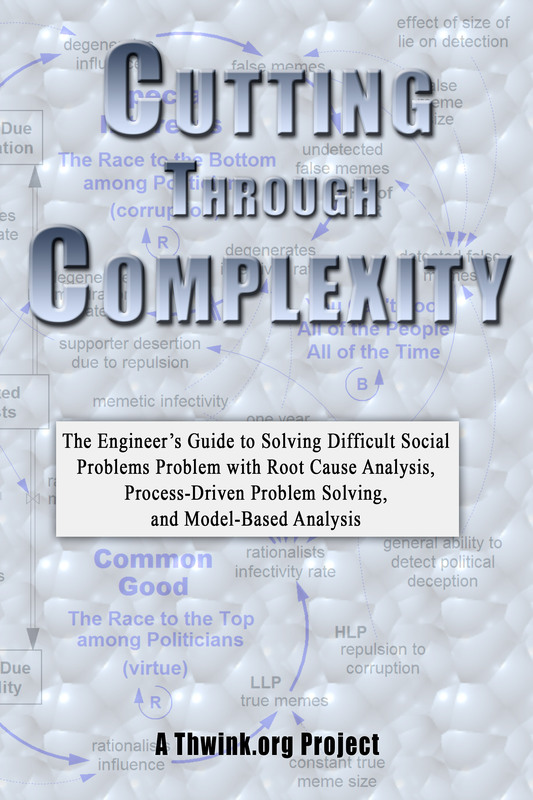 Finally, in one place you can read what is actually The Problem Solvers Guide to Difficult Complex Social System Problems. Also on this date the forum link was added because, good news, the forum is now open! The Club of Rome's internal newsletter has published a short article by Thwink.org, titled Can These Best Practices Make the Club Effective Once Again? Critique of the Harvard Project - This illustrates how the best laid plans of mice and men often go astray, if we do not follow an analytical process when attempting to solve difficult problems. Jack was accepted into The US Association of the Club of Rome. This is expected to open the door to working with some very high caliber people on the sustainability problem, at the national and international level. Update - After Can These Best Practices Make the Club Effective Once Again? was published in the clubs international newsletter, Jack was booted out of the US branch of the club. The ostensible reason given was there wasn't a quorum of the board when his membership was approved. The problem was with the US branch, who doesn't exactly enjoy reform. The international organization was a pleasure to work with. The Dueling Loops of the Political Powerplace paper was completed. This very readable paper describes the most important discovery so far: the existence of a fundamental social structure that lies at the very heart of why resistance to adopting a solution to the global environmental sustainability problem is so strong. On August 18 the Greater Gwinnett County group of Georgia mailed copies of How the Environmental Movement Can Find Its Way Again to 60 some chapters, 30 some field offices, all 15 board members, and all 7 members of the executive group. This is the first tangible change project to apply these ideas to an environmental organization. A three part article series summarizing A Model in Crisis (a book in progress) is now available. The articles later became the first three chapters of the Analytical Activism book. This key chapter has been completed. It presents a sample solution to the social side of the problem, which is the crux of solving the entire problem. The solution is presented as a collection of solution elements, a simulation model showing the effect of these elements, and a high level implementation plan. The chapter contains two small and quite pleasant surprises. It is in part 2 of Analytical Activism. Update - The chapter morphed into several others and disappeared, as the analysis proceeded. At the suggestion of a manuscript reader, a one page executive summary of A Model in Crisis has been added. This is available as a single page PDF file for a quick read. Update - The A Model in Crisis book was never finished, due to extreme change in the problem solving process used. The books contents became less and less relevant. However, the journey was worthwhile. This chapter has been completed for A Model in Crisis. It must be read with an open mind, because it argues that the world's leading solution to the global environmental sustainability problem is fallacious. Rather than publish updates as frequently, I've been using those extra minutes to work. The book outline has been redesigned to be in four parts, which are the same as the four steps in the System Improvement Process. Many new chapters have been written, including one with a rather interesting computer simulation model. Due to feedback and very strong interest in the three part article series mentioned below, it looks best to take these articles, turn them into chapters, add a few more, and call it Analytical Activism. If we had truth ratings today they could, and probably would, determine the outcome of the November 2, 2004 election in the United States. Here's a timely essay PDF for those concerned about the large amount of hype and fallacies in politics. This incorporates some of the ideas from A Model in Crisis. The thesis is that "The press is allowing a large amount of deception to occur in the political arena and elsewhere. ... A possible solution is creation of the new right of Freedom from Falsehood." A beautiful autumn at Stone Mountain Park, Georgia, US. Or is it Giverny?